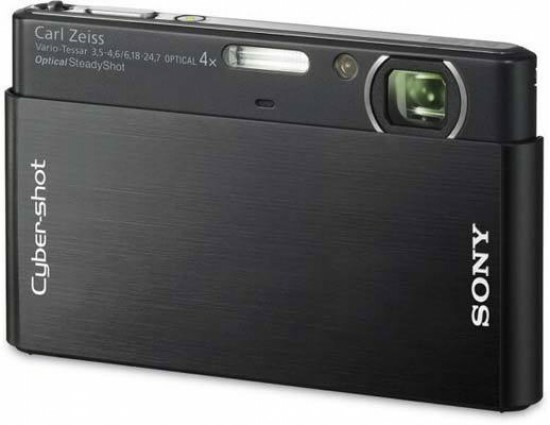 The Cyber-shot DSC-T77 is Sony's slimmest ever camera, measuring just 13.9mm at its thinnest point. Featuring a metal body, a sliding front plate and folded optics, highlights of the T77 include a 10 megapixel sensor, 35-140mm equivalent 4x zoom lens, 3 inch touch-sensitive widescreen LCD screen, and Super SteadyShot optical image stabilisation. Face and smile detection technology, an anti-blink function, intelligent scene recognition, and compatibility with Memory Stick Duo cards complete the headline specs. The Sony Cyber-shot DSC-T77 is available now in brown, green, pink, black and silver for £209 / $300. Read our in-depth review to find out if it's worth a look. Being another in Sony's popular T-series of flat-fronted, credit-card sized cameras activated/deactivated by sliding open the lens cover, the Cyber-shot 10.1 million effective megapixel DSC-T77 is slender enough to engender a size zero-style debate on 'how slim is too slim?' The lurid lime green version Sony's PR department supplied us with - it's available in a jellybean-like selection of five different colours - is also definitely love it or hate it. If that's not enough to cause you to stop reading immediately, the other talking point is that, like its T500 bigger brother announced in tandem (nearly twice the width, incidentally), this is a touch screen model. Thus the central portion of the back of the camera is entirely clear of any physical controls except its prod-able 3-inch widescreen LCD. The front plate also looks very clean: the lens is vertically stacked so that at no point does the optic (here again of Carl Zeiss branding) protrude from the bodywork. Its manufacturer further claims the Sony Cyber-shot DSC-T77 is the world's thinnest compact to boast a 4x optical zoom (35-140mm equivalent) - being 13.9mm at its thinnest point, 15mm 'thick' otherwise - and, holding it in my palm as gingerly as a baby bird at the time of writing, that's very probably true. It weighs 126g, so will slip easily into a shirt or blazer top pocket. At this point you'll probably be thinking 'uh-oh, camera shake'! And it's certainly true with its slim dimensions and slippery polished surfaces there's not much of the T77 to get a firm hold on. Fortunately there is optical image stabilisation on board as standard. With the sliding lens cover occupying roughly two thirds of the camera's frontal real estate, when slid shut the T77 barely resembles a camera in its inactive state; looks wise it's closer in fact to one of those 'executive' business card holders. When slid open, and the camera therefore activated, there is only just enough space for the pokey lens (of Carl Zeiss origin) to peep out above the rim of the cover, adjacent to which is a small circular window for the self timer/AF assist lamp and narrow strip for the built-in flash. Directly below is the built in microphone. Looking down on the Sony Cyber-shot DSC-T77, the top plate is a similarly minimalist affair, controls set out along a mirrored chrome strip. A small, recessed power button requires fingertip operation, glowing with a green light when in use, next to which is a narrow, raised lozenge-shaped shutter release button. An even teenier rocker switch at the end of the row is for operating the zoom, where it most naturally falls under the forefinger. Requiring a delicate fairly precise touch, this isn't the camera for the ham-fisted. A glance at the user friendly spec sheet reveals it is in fact best suited to the happy snapper, being targeted towards the taking of portraits as much as anything. On board are Sony's proprietary Smile Shutter mode - the camera automatically firing when it detects a grin from your subject - plus, of course, face detection, and here too anti blink technology - first witnessed in the unassumingly cheap cameras from General Electric. Sony's version takes two portraits in quick succession throwing away whichever one it deems your subject has his or her eyes closed for. More useful than all of these in practice - particularly for beginners - is Intelligent Scene Recognition, which serves the same function as Panasonic's Intelligent Auto Mode: namely the camera recognizes the subject you're pointing it at and automatically swaps settings to provide the best results. Thus, point the Sony Cyber-shot DSC-T77 at a close-up subject without manually activating the macro setting and you fortunately won't end up with a blurred result and the inclination to scratch your head. As with the pricier T500, in the absence of any optical viewfinder the T77's entire backplate is given over to the aforementioned widescreen 16:9 ratio LCD with which to frame and review images - hence the scarcity of actual physical controls. It's smaller in size to the one found on the T500 - 3-inches as opposed to 3.5-inches - and features a wider surround, thus enabling your thumbs to get a slight degree of purchase when holding the camera steady in both hands. Like other Cyber-shots in the series though, the rear LCD does inevitably and quickly become smeared with prints from your digits. Also shared with its bigger brother in the T series is the fact that, when left on default 4:3 ratio auto mode for shooting stills, both sides of the screen display black bands, in effect cropping the image to more closely resemble what you'll get when a regular JPEG is captured and downloaded. Still, flip the Sony Cyber-shot DSC-T77's sliding lens cover open and the user is ready for the first capture in just under two seconds (1.6 secs being the official quote), the aforementioned compositional display appearing on the back screen with no optical viewfinder as an alternative. Press the shutter release button down halfway and the camera is quick to determine focus and exposure, the focus point illuminating in green to signify this has happened. Go on to take the shot and there's a three second wait while the shot is captured and written to card, the screen blanking out momentarily. While this isn't bad, generally operation feels more sluggish than that of the pricier T500. To review the shot properly, press the dedicated playback button top right of the rear LCD, the only actual physical control on the entirety of its backplate. There's a further protruding 'lug' for attaching a wrist strap to, middle right of screen. In auto capture mode the Sony Cyber-shot DSC-T77's screen displays a fairly similar range of icons and menus to that of the more sophisticated T500. Top left of the touch screen is a virtual button marked 'Home' which Sony intends as providing an overview of the camera's functions. Press this and you're provided with a toolbar running along the bottom of the screen that offers one touch affirmation of shooting mode, playback folder, slideshow, direct print, memory format or basic set up options. To us this 'Home' destination has always seemed slightly unnecessary - for example, essential info such as the shooting mode you've selected is automatically displayed on screen anyway - and the bottom of the left-hand toolbar features a 'Menu' button from which you're provided with a more detailed view of the functionality on offer. 'Home' may be intended as a simplified hand-holding feature for anyone daunted by having too many options at their disposal at once, but for us serves only to confuse things. Press Menu instead and the left hand bar changes to a white background offering the sort of shooting options you'd expect ranged over two screens. Scroll up or down, and a further toolbar extends horizontally out across the screen revealing the full array of choices for whichever feature you've paused on. Here you'll find the ability to adjust image size and quality, and image ratio, from 4:3 to 3:2 or even 16:9 for replaying on an HD TV. We also witness here the ability to tweak the likes of exposure compensation (+/- 2EV), switch red eye reduction on or off, activate SteadyShot on a per shot or continuous basis, and switch from single capture to continuous, with, unusually for a basic snapshot model, the ability to bracket a sequence (three shots at either 0.3EV, 0.7EV or 1EV apart). The latter option on the Menu toolbar, denoted by a briefcase icon, takes the user straight to rather limited additional shooting settings, such as turning on/off auto picture orientation, likewise the AF illuminator. Wedged between the on-screen 'Home' and 'menu' buttons left of screen meanwhile are the Smile Shutter feature (only available in auto, not Program mode), the ability to turn the self timer on or off plus call up a variety of recording modes, including several scene modes (with 'underwater' - requiring a specialist case - alongside the more regular pre-optimised snow, beach and fireworks settings) along with auto, program stills capture or video capture (no HD here, just standard definition 640x480 pixels, albeit at a better than average 30fps) Also here is a greatly simplified 'easy' mode plus access to ISO settings. While easy mode removes most of the on-screen info and provides instead the number of shots remaining in very large letters for granny to read, selecting Program mode provides an additional toolbar along the base of the screen. Running from left to right you firstly have a button accessing focus points (multi segment, centre-weighted or spot) plus the ability to manually select focal distance, running between one metre and infinity, with three or seven metres the intervening options. The next option provides purely the choice of multi frame metering, the following one the choice of ISO options, from ISO 800 up to ISO 3200, while the third button provides direct access to +/-2EV exposure compensation. Staying in capture mode, the second parallel black bar to the right hand side of the screen features the ability to select from the flash modes on offer (auto, forced, slow sync, off), plus, just below it, macro close up or auto focus. The bottom virtual button marked 'display' lets you tweak just that, with normal, simple or 'off' (image only) options, plus the ability to alter brightness and - unusually for a snapshot model - call up a live histogram. Switching to playback mode, and, alongside the 'Home' and 'Menu' buttons that remain, users have the ability to access folders of images, set a slideshow in motion or delete duff shots. Cursors on the right hand of the screen allows you to scroll up and down through a thumbnail selection of captured images, while pressing your finger onto one in particular prompts it to be displayed full screen for easier scrutiny. TheSony Cyber-shot DSC-T77 responds well to each button press and efficiently too, though we sometimes found the camera paused and took a couple of seconds to display an image when switching from capture to playback, suggesting processing speed could be further improved. The bottom of the camera meanwhile features an unprotected multi connection port (combined USB and AV out lead supplied) plus a lockable compartment that houses removable media card (here Memory Stick Duo or Duo Pro, with 15MB internal memory to fall back on) alongside wafer-thin rechargeable lithium ion battery. As we found with the T500, the T77's battery life is shorter than average for its class (220 shots, or 110 minutes of use with LCD on) suggesting a degree of compromise has been inevitable to bring a camera this slender to market.